October will see the launch of a fun new children’s game with the more serious purpose of testing their hearing. The game, Sound Scouts, was developed by Carolyn Mee of cmee4 Productions in collaboration with National Acoustic Laboratories (NAL). The beauty of the game is that it not only identifies hearing loss and hearing issues, but also distinguishes between conductive hearing loss, sensorineural loss and central auditory processing disorders. Despite newborn hearing screening, many children are first brought to an audiologist for a hearing assessment because they are performing badly at school. All too often, their self-esteem and attitude to school have been adversely affected by the time a parent, teacher or other professional works out that hearing loss might be the cause of their problem and seeks an assessment. Screening the hearing of all children as they enter school is sufficiently expensive that in most places it doesn’t happen. Sound Scouts is an inexpensive app for mobile devices played by the child at home with a supervising adult. It is suitable for children as young as four years old. Sound Scouts is fun and easy to play. It follows the story of Patch, a bionic-eared dog, who works in the National Park. When one of the rangers goes missing, Patch must use his hearing to help solve the mystery and locate the ranger. The game is built around a speech-in-noise task and a tone-in-noise task, preceded by a separate speech-in-quiet calibration game that both provides one of the test metrics and is also used to set the level of the stimuli for the main game. 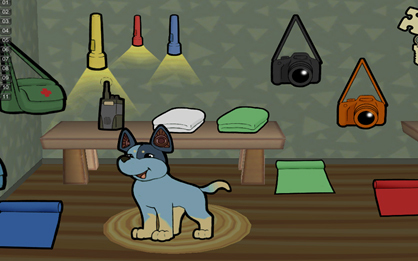 A scene from the game in which the child has to help Patch the dog pack a bag by tapping the items mentioned in the audio. Most importantly, the children are engaged in the game and don’t know they’re being tested. For more information, go to www.soundscouts.com.au. Sound Scouts is currently available on iOS, and coming soon to Android.